How do we make a game from nothing to something? We use a bunch of editors we build ourselves, and other tools that are generally available. Believe it or not, one of the biggest tools we use is Microsoft Excel. It’s a great management tool to put a bunch of data in one place and do automatic computations. We also use SVN, a repository system that allows us to control file revisions and easily revert to previous versions if needed. We use it is to keep the most up-to-date files without worrying about getting overwritten. As mentioned in the video, we also follow strict naming conventions to make it easier to localize into different languages later on. Campaign mode: Has specific victory conditions depending on story or lore such as to take over a particular building, survive in X number of turns, defeat a certain unit, build X units, collect X amount of gold, etc. 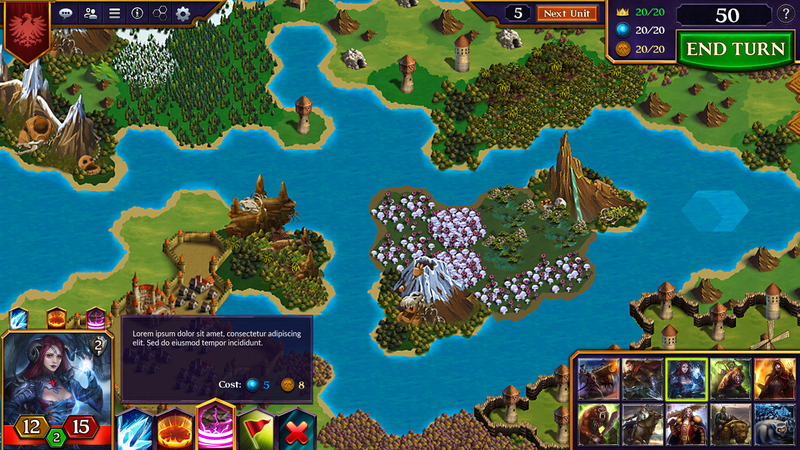 Multiplayer mode: Let players set up victory conditions at the start of the game ad create different gameplay modes. By default, you have to defeat all your enemies and take all their structures so that they can’t summon any more units. Units can take over structures and take on the structure’s properties. We also use these structures to give the maps a sense of place and have them tied to the lore and the culture of the different races in the game. Similar to the weaponry, fashion, and technology we’re using in this game, we have slightly modern structures based on the 1700s. The Orcs are responsible for the Infection, which is a deep part of the lore. (Starts at 11:34 in dev blog video #3.2) They were losing in the great war many years ago, and they prayed to the God of Death to help them destroy their enemies – and so they were given the power to infect the dead with fungus and spores, which eventually took over the lands, driving away the other races. A different faction of Orcs went to the Sun God and banded with other races to form a community that is simple and peaceful. This is an example of how not all creatures from the same race are the same – so we made factions that aren’t racially based. We’ve divided factions from races, to make sure that players have different options instead of strictly playing a certain race. (Starts at 15:20 in dev blog video #3.2) Each faction, such as Redkeep, has its own lore and may have a mix of elves, humans, constructs, and other summonable units. Meanwhile, Ivoria is a huge jungle area with wizards of different races who have powers over animals and beasts. Tirezia also has its own beast units, but in a farmland area. Adding these different faction choices gives the feeling of being involved into the lore and history of the game, and also allows players to mix and max different units. How are we going to monetize this game? (Starts at 17:56 in dev blog video #3.2) It will NOT be free-to-play – everyone should have reasonable chance to play this game without putting in a lot of money to buy packs for a chance to get better units. We haven’t set a price point yet, but we are discussing whether to price it differently on the various platforms. What we can tell you is there will be an initial purchase where you get the full game, and unlock the factions through the campaign. We received various feedback from people who want everything immediately available, but we felt that it cheapens the experience. We want players to have a sense of success and completion in unlocking new units, so when they player multiplayer, you know which people have played the game. And again, they also become more involved in the lore and story.